We stopped off at another rice field viewing point and we were able to walk down to the terraces, such a visually stunning sight! 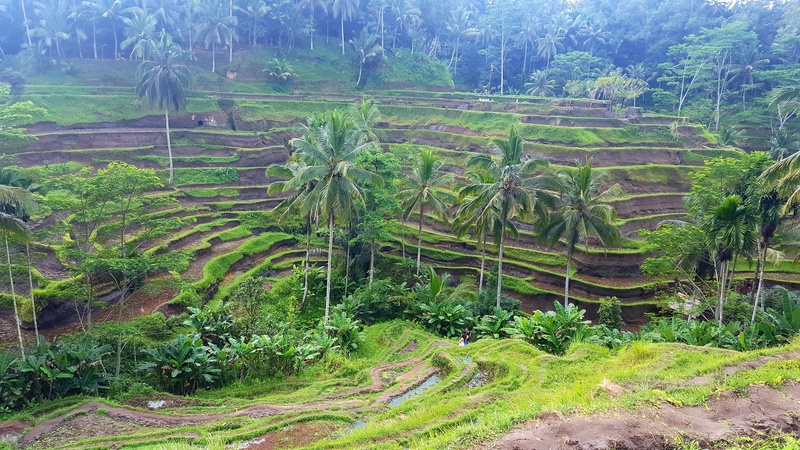 This particular spot allows you to get up close and personal to see the subak; the traditional Balinese cooperative irrigation system. At this time of the year, the rice fields have been recently harvested so there were not too many farmers in sight but I can only imagine what they do daily. This was on my ‘to-do list’. 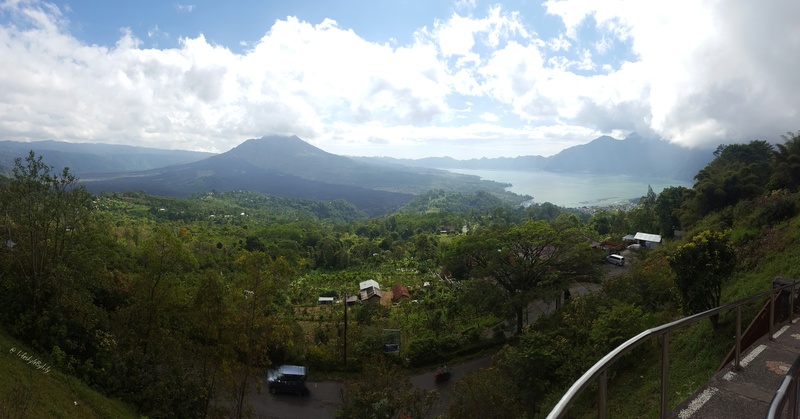 At this time of the year, the volcano climbs are not as frequent and easy to book so this time, we went to the National Park for the best viewing point. The black land where lava streamed down the volcano is clearly visible but our guide said that the area recovered well from the 1994 eruption. This stop was a personal request of Mr. T’s. 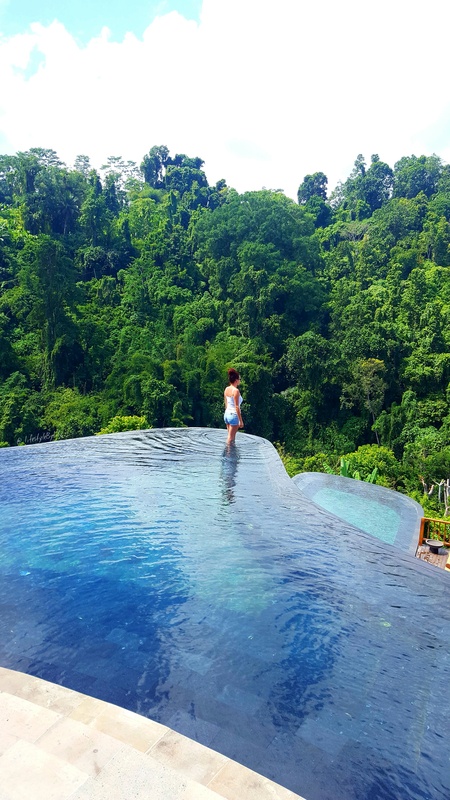 He is an avid Instagram user and spotted the Hanging Gardens located outside Ubud. Unfortunately, we did not do much research on the hotel as we arrived to find that we could not walk in for lunch or to see the hotel. We paid approx. $145AUD to have two main meals and a welcome drink and a look around the main grounds of the hotel. As this was a one off experience, Mr. T wanted to treat us to a lunch with a view. The hotel costs a small fortune per night and so it was rather quiet but I guess that is what the attraction is to such a retreat. After paying for the lunch, we went in a small cable car to get down to the restaurant level…this was pretty cool! We had a tasty lunch followed by a look around the grounds and some pictures in the infinity pools, however, we were not allowed to swim in the pools. This is definitely a special occasion type of hotel, it is very secluded and everything you need, except the beach, is a cable car ride away. 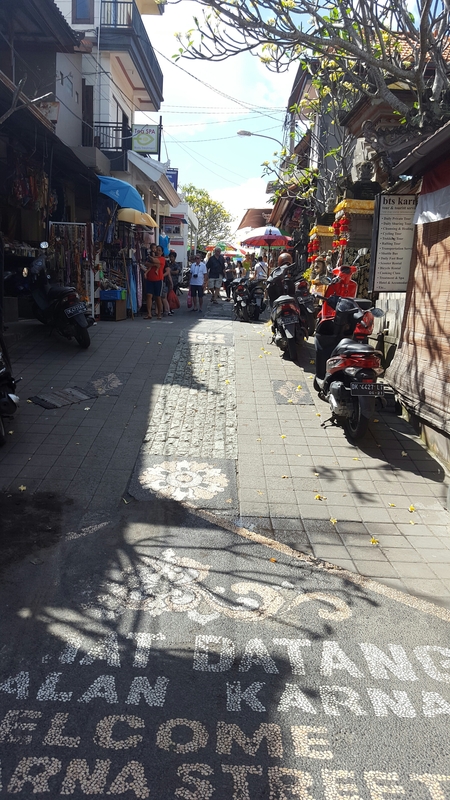 This was one of my requests, I really wanted to see the hustle and bustle of Ubud! I had heard about the markets and couldn’t quite believe my eyes when I saw how big there were. I picked up a few souvenirs for my friends in the markets but a lot of the stalls were selling the same thing so we made our way through them quite quickly. Across the road from the markets, those of you interested in history can take a walk around the old palace grounds. They were rather busy as it is a huge point of interest for tourists. 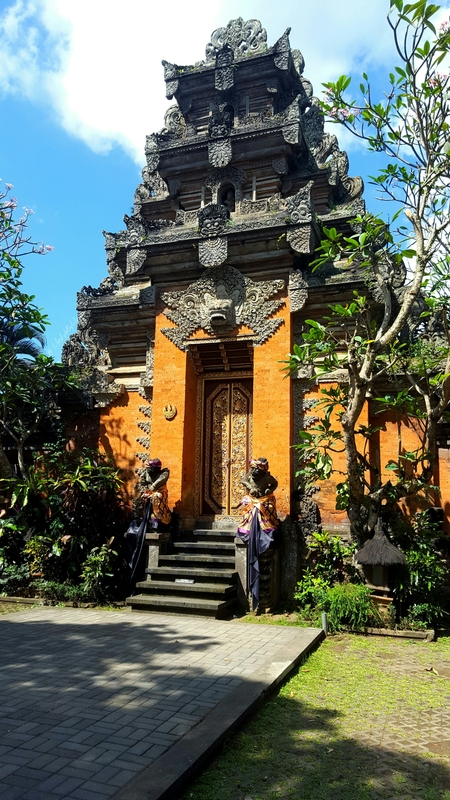 Ms. D & Ms. G had been to Bali a few weeks before us so we took their advice and went to the Monkey Temple. The monkeys are obviously the first thing you will see but the grounds of the temple itself were stunning. Our guide came into the temple with us and told us snippets of information as we walked around it. 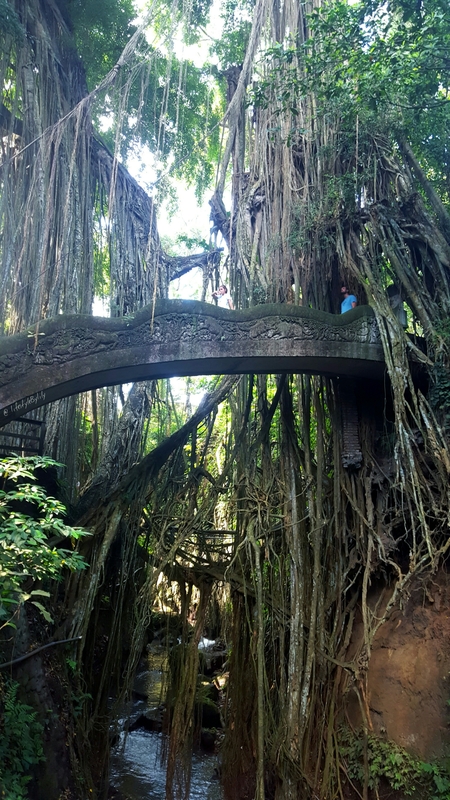 It was beautiful in structure and the long vines hanging from various tresses made perfect swings for the many monkeys residing in the temple. We had a fabulous day and after an adventure packed day the day before, we decided that the five stops were more than enough. The tour guide offered us more things to do but we were happy with the adventure so far and hoped they would enjoy an earlier finish than the previous day. We decided to go for an evening drink down at the beach and were on time to watch the sun go down, a perfect end to a fantastic day. Hi Lisa, thank you for an amazing blog. Bali looks beautiful. It was fab Sara, have you been? Fab, it is definitely worthy! That pool looks insane!! So jelly. Beautiful post. Thanks Lisa, it was an amazing trip! I live in Bali but never tire of reading about it. You covered a lot of ground. Lucky you Rosie! Yeah we did quite alot. The private tours were amazing as we could pick where we wanted to go rather than told where to go. I had my research done and knew what I wanted to see. Any other spots you recommend? I suppose I will try to go soon! Thanks for the info! My partner and I will be there on Sunday so this was quite helpful! 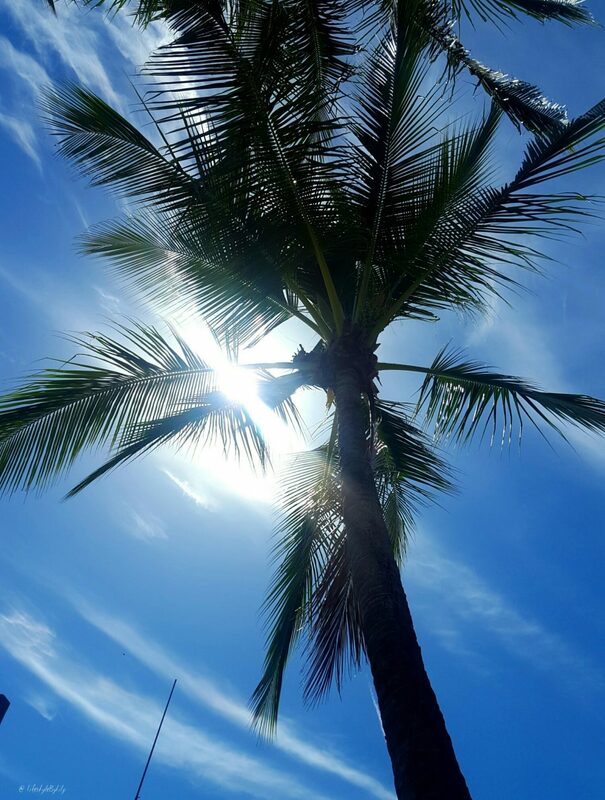 Have a wonderful time, it is such a beautiful place!